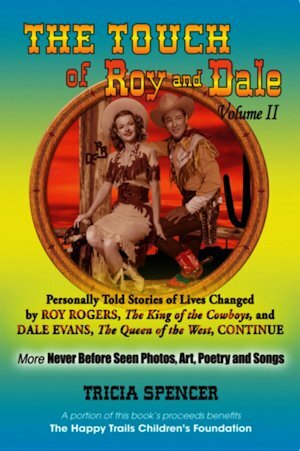 Tricia Spencer’s new book, The Touch of Roy and Dale, Volume II, personally told stories of lives changed by Roy Rogers, the King of the Cowboys, and Dale Evans, the Queen of the West. This is the much anticipated sequel to the original 2011 book, The Touch of Roy and Dale, Vol. I. This interesting book tells about the impact and influence of Roy and Dale; as only their fans could tell it. Like the original edition, Volume II is an intimate look at the rippling affect Roy and Dale had on the lives of others, as personally told by family, friends and fans from all over the world.